**** ALL orders are at least 7 business days until they can be shipped at the moment. If you need it sooner than that a RUSH must be added to your order. It is available in the shop. Choose your favorite Character or Disney icon and I'm sure I can create a silhouette decal of it to decorate your Magic Band with! 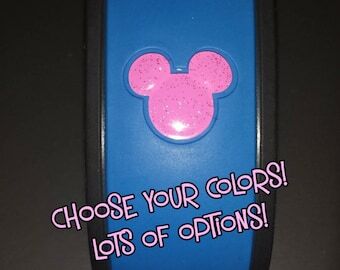 Also choose your color in either solid vinyl for $1.00 cents each or glitter vinyl for $1.50 cents each. All color choices are in the listing images. A great way to add fun to your band! Easy to apply! 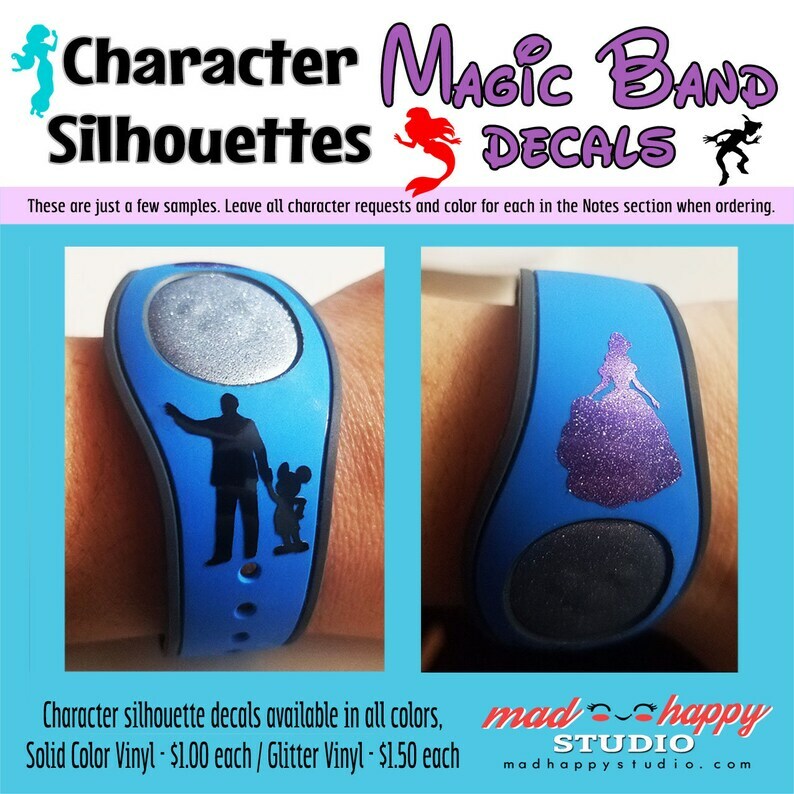 Do the character decals fit the 2.0 Magic Bands? Yes. 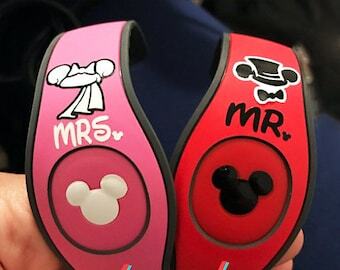 All of the character, small Mickey/Minnie, names and monograms do fit the 2.0 style bands. If you have an original style band please note that in the notes section when ordering to be sure the sizing is accommodated. But almost all fit both style bands already. Yes. They are made with a strong adhesive vinyl that stay well on the bands even through water. Many customers have said they lasted through their water park trips as well with no problems. I do recommend applying the decals at least 24 hours before using them around water to assure a good time for them to adhere to the band well. Are the printed vinyl decal bands sunscreen/bugspray proof? No. The strong chemicals that are in these products can affect the print ink on the vinyl of these printed bands. When applying the decal to the band be sure hands are washed and dried. 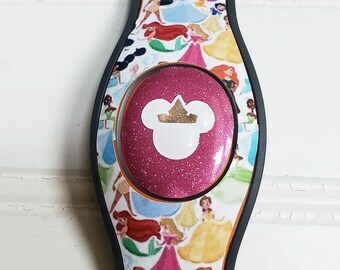 When putting on a magic band that has a printed vinyl decal such as the Minnie Dots, Star Wars, Haunted Mansion, Tower of Terror, Mickey Bar, American Flag, Rainbow or Pirate Decal band skins please be sure to apply all sunscreen, bug spray, lotions or perfumes first. Then please wash hands well and then put the Magic Bands on wrists. What if the shipping address was wrong when I ordered? It is the customer's responsibility to be certain they checkout with the correct shipping address. Please let me know immediately if the address connected to your Etsy account is wrong or outdated. That is the only address I have and that I automatically send your package to through Etsy's shipping services. I can change the address prior to printing the mailing label but once it is shipped there is nothing I can do to change it's destination at that point. If your order is shipped to the address on the order it is your responsibility to pickup your package from that address or you will need to reorder at your own expense. The USPS tracking on my order shows as delivered but I never received it. Unfortunately, once the package is mailed to the address provided by the customer it is in the responsibility of the USPS. I usually recommend checking with your local post office to see if they held the package for some reason and then you must file a lost package through them. All processing times are posted with each individual listing. 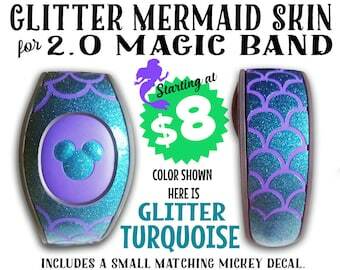 But for Magic Band decals specifically some times there is a higher volume of orders and the processing time is longer. I do recommend to try and order at least 2 weeks prior to your trip dates. I do try and ship out orders in less than a week or sooner if I can. You can add a Rush My Order listing onto your order for $8 extra and that has it ship out the following day (if not on a weekend) and also upgrades it to ship as Priority Mail instead of the standard First Class Mail.